The status of Muhammad being the final prophet is very high among the traditional Muslim circle in comparison to other messengers and prophets of God just like Jesus among the Christian circle, even though He has repeatedly warned us in the Quran not to make any distinction between any of His messengers (2:136 & 285, 3:84 and 4:152). As a result, the volumes and volumes of hadith books are written some 200 years after his death in one side while on the other side he is consistently being elevated and focused in their praise and prayers that nullify their all works due to idol worshiping as idol worshipping contributes nothing to their souls. Since God is aware of all our situations (10:61), He has let us know that Muhammad is a messenger like Musa that can be confirmed from the Quran to stay in the straight path and to remember Him in a right way. There are many verses in the Quran that has addressed the matter but here are a few to cite as examples that may help us to make it clear in our hearts. a. Pertinent verses in the Quran. [46:12] And before this, the scripture of Moses was a guidance and mercy. This is a confirming scripture in Arabic tongue, to warn those who transgressed, and to give good news to the righteous. [46:29] And when we directed to you (Muhammad) a number of the Jinn, to listen to the Quran, then they attended it; they said: “Listen quietly.” Then, when it was done, they returned to their people as warners. Note: A group of the Jinn listened to the Quran and then they went back to their people and warned them with it. God has set an example here for all of us to share the truth with others when we come across any. [46:30] They said: “O our people, we have heard a scripture sent down after Moses, confirming what was before it to guide to the truth and to a straight path. Note: A group of the Jinn who listened to the Quran conveyed this message to their fellow jinns when they returned to them. There is a reflection in the verse that Muhammad is a messenger like Musa because of referring to a confirming scripture revealed to him to guide to the truth and to a straight path after Musa mentioning by name in the verse. Note: God forgives our sins as well as He protects us from the painful retribution if we respond to the caller of God, i.e., His message. [46:32] And whoever does not respond to the caller of God, then he cannot escape in the earth, nor for him is there any protectors besides Him. Those are in far astray. Note: Those who will fail to respond to the caller of God cannot escape in the earth nor is there any protectors for them besides God whether humans or jinns. b. Both Muhammad and Musa were chosen to be a messenger prophet. [33:40] Muhammad is not the father of any man among you, but he is a messenger of God and the last prophet (wa-laakin rasoola l-lahi wa-khaatama l-nabiyeen –nabiyeen being plural noun). And God is fully aware of all things. [19:51] And mention in the scripture, Moses. Indeed, he was chosen and was a messenger prophet (innahu kaana mukh’lasan wa-kaana rasoolan nabiyyan –nabiyyan being indefinite noun). Note: The ending phrases of the above verses indicate the same expression for both of them being a messenger prophet except the difference that Muhammad is the last prophet, which means he delivered the last scripture. c. God Himself taught Muhammad while He spoke to Musa. [53:5] The Most Powerful taught him (Muhammad). [4:113] If it were not God’s grace upon you (Muhammad) and His mercy, some of them would have misled you. But they mislead except themselves and they cannot harm you in anyway. And God has sent down to you the scripture and the wisdom, and He has taught you what you did not know. Indeed, God’s grace upon you has been great. Note: Here is another proof for focusing on the message given to the messengers instead of the human messengers. d. Muhammad and Musa were given the statute book. [25:1] Blessed is the One who sent down the statute book to His servant (Muhammad), so he can be a warner to the world. [36:11] You (Muhammad) can ONLY (innamaa) warn him who follows the reminder (Quran) and fears the Most Gracious in the unseen. So give him good news of forgiveness and an honorable recompense. [21:48] And we gave Moses and Aaron the statute book, a light, and a reminder for the righteous. e. Ten commandments were given to Musa during his appointment at Mount Sinai. You shall know that: “There is no other god beside God,” and ask forgiveness of your sins and the sins of all believing men and women. God is fully aware of your decisions and your ultimate destiny (47:19). God bears witness that there is no other god except He, and so do the angels and those who possess knowledge, truthfully; there is no other god except He, the Almighty, Most Wise (3:18). When it was said to them: “There is no other god except God,” they were arrogant (37:35). 2 Thou shall make no image of God. And Abraham said, “My Lord, make this city secure, and protect me and my children from worshiping idols.” (14:35). The Day He will say, “Call My partners those who you claimed,” then they will call them but they will not respond to them. And we will make a barrier between them (18:52). 3 Thou shall not use God’s name in vain Do not subject God’s name to your casual swearing, that you may appear righteous, pious, or to attain credibility among the people. God is Hearer, Knower. (2:224). Your Lord has decreed that you shall not worship except Him, and you shall honor your parents. When one or both of them reaches the old age, you shall never say to them, a word of disrespect nor shall you shout at them, but speak to them nicely (17:23). There is a disease in their hearts and then God has increased their disease. They have incurred a painful retribution for their lying (2:10). Do not conceal the testimony, and whoever conceals it, he has sin in his heart, and God is aware of what you do. (2:283). 7 Thou shall not kill. We have decreed for the Children of Israel: “Anyone who kills a person who has not committed murder, or who has not committed corruption in the land; then it is as if he has killed all the people! And whoever spares a life, then it is as if he has given life to all the people.” (5:32). The Sabbath was decreed only for those (Jews & Christians) who ended up disputing it. Your Lord is the One who will judge them on the Day of Resurrection regarding their disputes (16:124). O you who believe, when the call is made for the Prayer (lilssalati) on the day of Friday (al-jumu’ati), you shall hasten to the commemoration of God, and drop all business. This is better for you, if you only knew (62:9). Note: However, the Sabbath was relinquished with the revelation of the Quran while God has ordered us to make every effort and drop all businesses to attend the Friday congregational prayer. We should force ourselves to observe the commandments, even if it means giving up on trade. We may tend to our business during the rest of the day but with continuous appreciation of God (62:10). We are blessed with the knowledge to mathematically confirm many of our given rites as well as the crucial events and commandments to remove any traces of doubt from our hearts. God willing, we have the opportunity to apply that tool to confirm our concern that Muhammad is a messenger like Musa to eliminate any traces of confusion from our hearts. There are many references of Muhammad and Musa in the Quran. But Muhammad has been mentioned 4 times by name while Musa has been mentioned 129 times by name in the Quran. If we add the number of times they have been mentioned by name in the Quran, the total is a multiple of 19 => 4 + 129 = 133 (19x7), which establishes such relationship between them to make it simple and clear for our understanding. It is mention-worthy that both Adam and Jesus are mentioned 25 times each by name in the Quran, which is a direct reflection of mathematical coding of the Quran and a physical proof for all of us to understand the equality in the creation of Adam and Jesus as per God is concerned (3:59). This provides us a clear evidence to eliminate any confusion and controversy around the birth and death of Jesus as well as his return, and is an opportunity for millions of Christians to get out of the trinity, which is a false doctrine. God spoke to Musa directly at the Mount Sinai and the details of the event are mentioned in the Quran. This remarkable event in the human history is detailed out in 98 verses of the Quran across 6 initialed suras. 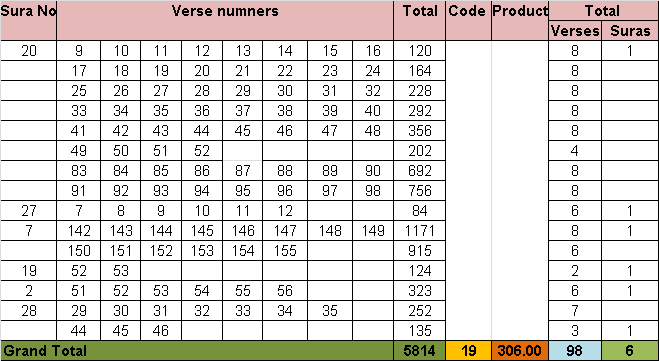 If the relevant sura and verse numbers of all these references are added, the sum is a multiple of 19 => 5814 = 19 x 306 (See Table below for details). It is well known to the Muslim world that the entire Quran was placed into prophet Muhammad’s soul in a special night known as the Night of Power in 13 B.H (609 A.D.) when he, the soul not the body was taken to the highest Heaven. Subsequently, the angel Gabriel helped the prophet release a few verses of the Quran at a time, from his soul to his memory over the time period of 23 years to place the whole Quran into his memory. This breakthrough event of revealing the whole Quran in one night is mentioned in a number of suras covering its different aspects. There is a short sura which has addressed the details of the process including its significance and completion while a part of some suras covers other important aspects of the event. There are 26 verses across 5 suras in the Quran that cover this awesome event. The total of the relevant sura and verse numbers associated with the event is a multiple of 19 = 589 = 19x31 (See Table below for details). However, God has not instituted any ritual around the night being a special one except to study, understand and follow the honorable, wise, glorius, great Quran (56:77; 36:2; 50:1 & 85:21; 15:87) as our guidance (2:185) and the reminder for the world (12:104, 38:87, 68:52 and 81:27), and we should disregard any ritual around it introduced by tradition being innovation and misconception. Both Muhammad and Musa were given the statute book and the reminder to guide the respective generation of people. Like the Quran, the scripture of Moses was a guidance and mercy for the people he has been chosen for. While there is specific mention of the scripture of Musa with regard to the event of listening of the Quran by a group of jinns. They are both messenger prophets but their guidance period is different, and the scripture given to Muhammad is the last scripture. If we can understand guidance period and make focus on the guidance (message) given to them, it would be more clear to us and there should not have any confusion to draw this conclusion. God talked to Musa at the Mount Sinai but behind the barrier and gave ten tablets containing 10 commandments while He taught Muhammad placing the entire Quran in his soul in the highest horizon and he saw him in another descent. Moses was given ten commandments through tablets which are not any more than the same message given to other messengers down the generations including prophet Muhammad. Musa faced the greatest tyrant on earth to free the people of Israel from the oppression of Pharaoh while Muhammad fought many battles against the idol worshippers, and the final victory came through entering Ka’ba for performing Hajj safely by defeating them. There are both literary and mathematical proofs and symmetries from the Quran, even from the historical perspective to believe that Muhammad is a messenger like Musa. Some of us may be aware that both Muhammad and Musa are messenger prophets while many Muslims believe that Muhammad is the latest and the greatest prophet disregarding the commandment given in the Quran ‘not to make any distinction between any of His messengers.’ They also believe that he will intercede for them on the Day of Judgment to help them enter Paradise. Thus, their excessive focus on Muhammad as a person involves them to idolize him in their praise and prayers instead of dedicating their praise and prayers to God alone. However, the concept of intercession predominantly exists among the Christian and the Muslim communities. The Christians believe that Jesus being Messiah will save all of them while Muhammad will intercede for the Muslims, even though intercession is a myth according to Quran, even from a common sense. However, it may be difficult for the majority Muslims to accept the fact that Muhammad is a messenger like Musa because of centuries-long ignorance, even it is from the Quran supported by both literary and mathematical proofs. On the other hand, a few of us may be surprised by knowing and reflecting on God’s unexceptional teaching in the Quran, when many of us are away from the straight path because of preset programming in their minds, which can help them to get out of idol worshiping. There are clear proofs and unexceptional events associated with them to confirm that Muhammad is a messenger like Musa. This fact might be an opportunity for millions of Muslims to help them to get out of their excessive focus on Muhammad and of idolizing him in their praise and prayers. Thus, they can avoid preset programming in their minds about Muhammad and can establish the worship of God alone in their hearts and dedicate their praise and prayer to Him alone to be responded by Him to grow their souls. Those who truly believe in God and are certain about the Hereafter and uphold the Quran as a valid source of all religious laws and teachings may accept the truth and re-educate themselves based on this parallelity to perfect their beliefs and practices to save their souls.